Noise sensitivity is a personality trait that predicts noise annoyance.,, The key characteristics of noise-sensitive individuals are that they are more likely to attend to sound and evaluate it negatively (e.g., find it threatening or annoying), and they have stronger emotional reactions to noise, and, as a consequence, have greater difficulty habituating to noise. Noise sensitivity has a large impact on noise annoyance ratings, lowering annoyance thresholds by up to 10 dB. A criticism of using noise sensitivity as a measure is that it may really reflect a greater tendency to poor health or vulnerability. Under this hypothesis, people experiencing higher levels of noise sensitivity would be expected to experience worse health, irrespective of their degree of noise exposure. In a previous study, we used a natural experiment to address this criticism by showing that noise-sensitive people only had poorer self-reported health if they lived in a noisy environment, in this case, near a motorway. If they lived in quieter (but socioeconomically matched) areas, distant from major noise sources such as large roads, airports, trains, or industry, noise-sensitive people did not differ in terms of their self-reported health compared with non-noise-sensitive people. This study addresses the following two other areas of doubt: that the findings are specific to motorway noise and that the findings are temporary and may not be sustained over time. Both of these are addressed in this study by considering data, based on the methodology used previously, collected in the same two areas (one close to an international airport area and the other in a quiet area), and twice over a 3-year period. Data for this study were collected in Wellington city, New Zealand in 2012 and 2015. Questionnaires were delivered to the mailboxes of residents living within 250 meters of Wellington airport and within the 65 dB Ldn contour (Airport Group) or living in a socioeconomically matched Wellington suburb (Non-airport Group), which was not near the airport or aircraft flight paths or close to any other significant source of noise. Socioeconomic matching was performed using data from the New Zealand Deprivation Index, which assesses socioeconomic status based on car and telephone access, the receipt of means-tested benefits, unemployment, household income, sole parenting, educational qualifications, home ownership, and home living space. Residents over the age of 18 years were invited to participate by completing the questionnaires anonymously and returning them using a postage-paid envelope that we gave them. The study was approved by the Auckland University of Technology Ethics Committee (AUTEC Reference number 12/256). 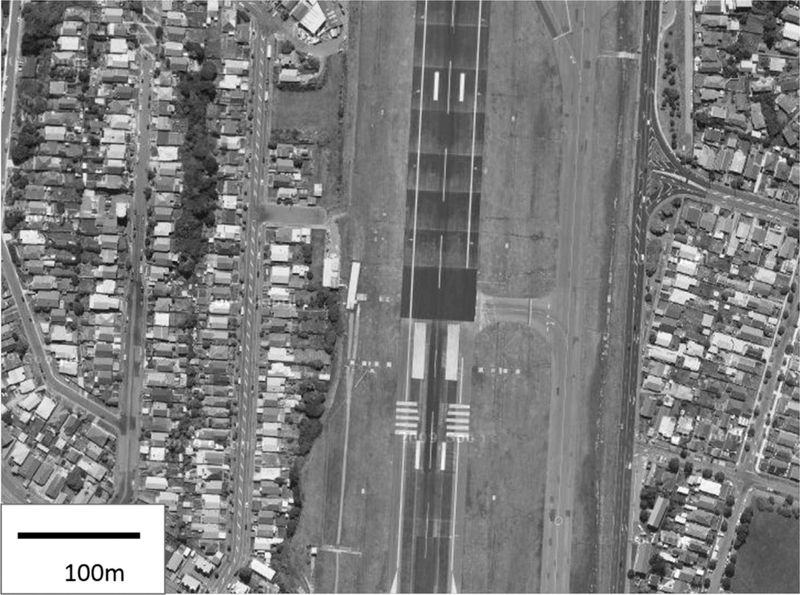 Wellington’s airport is built close to residential areas [[Figure 1]]. The number of flights at the airport did not change much between 2012 (90,000) and 2015 (93,000). The questionnaire was entitled “Wellbeing and Neighbourhood Survey” and was designed to disguise the true intent of the study, with residents invited to participate in research investigating their place of living and their well-being. The survey contained 58 items categorized as HRQOL (26 items), amenity (two items), neighborhood issues (14 items), environmental annoyances (seven items), demographic information (eight items), and noise sensitivity (one item), which were presented in this order. To measure health, we employed the short form of the WHO’s HRQOL (WHOQOL) scale, called the WHOQOL-BREF, which adheres to the WHO’s definition of health as “a state of complete physical, mental and social wellbeing and not merely the absence of disease or infirmity.” The WHOQOL adopts a multidimensional profile of HRQOL, dividing it into the following four domains: physical health (seven items), psychological well-being (six items), social relationships (three items), and environmental factors (eight items). Two additional items assess the overall quality of life and self-rated health. Each item was scored on a five-point scale, where a low score corresponded to a negative assessment of that aspect of life and a high score corresponded to a positive assessment. Example questions include the following: “Do you have enough energy for everyday life?” (physical), “How often do you have negative feelings such as blue mood, despair, anxiety or depression?” (psychological), “How satisfied are you with the support you get from your friends?” (social), and “How satisfied are you with the conditions of your living space?” (environmental). Amenity and neighborhood problem items were included primarily to “camouflage” our interest in noise exposures and were not used in this study’s analyses. We asked the respondents how much they agreed with the following two statements: “I am satisfied with my neighbourhood/living environment,” and “My neighbourhood/living environment makes it difficult for me to relax at home.” The neighborhood problem scale consisted of 14 items. Of the seven items enquiring about annoyance, four asked about air quality, while three asked about annoyance because of aircraft, neighbors, or other sources of noise. The annoyance to noise items were based on recommendations issued by the International Commission on the Biological Effects of Noise and in our own previous research.,, Respondents were asked to consider the last 6 months and how annoyed they had been by noise from traffic, neighbors, and “other” sources. They were asked to respond to each item on a five-point scale from 1 (not annoyed at all) to 5 (extremely annoyed). Noise sensitivity was assessed using a three-point scale, wherein each participant was asked to rate himself or herself as “not noise sensitive,” “moderately noise sensitive,” or “very noise sensitive.” This question was placed near the end of the questionnaire form among the demographic questions. Demographic information was also collected, which consisted of information on gender, ethnicity, age, the highest level of education completed, current employment status, and whether the respondent was currently ill or had a known medical condition. Two surveys and a prepaid, return-addressed envelope were deposited into the letterboxes of eligible houses. The participants were asked to complete the surveys independently at a convenient time, to think about their life in the last 2 weeks, and circle the number on the scale that best reflected their answer to each question. After the completion of the survey, the participants were instructed to return the survey/s in the prepaid envelope provided. No incentives to participate were offered. Five separate analyses of variance were conducted for the overall WHOQOL score and for each of the four WHOQOL domains (physical, psychological, social, and environmental). Year (2012 and 2015), area (airport and non-airport), and noise sensitivity (not, moderate, and very) were modeled as the factors, with WHOQOL scores as the dependent variables. Evidence for a differential effect of noise sensitivity on health for different noise environments would be a significant two-way interaction between noise sensitivity and the area (airport or non-airport). Evidence for a change in this relationship over time would be a significant three-way interaction among the year, the area, and noise sensitivity. On the basis of preliminary analyses using chi-squared tests, [Table 1] shows disparities between the areas in education completed (both years) and current illness (2015). All analyses were conducted controlling statistically for these factors. 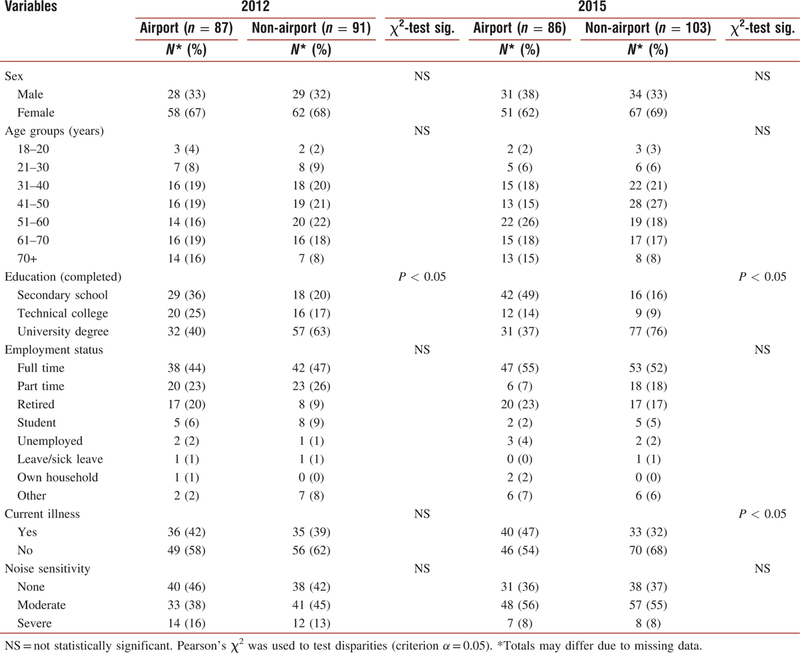 The two areas were closely matched demographically, except that the members of the Airport Group tended to be less well educated in both 2012 and 2015 than in the Non-airport Group, and the Airport Group was more likely to have current illness or a medical condition in 2015 compared with 2012 [[Table 1]]. There was no difference in the noise sensitivity profile of the two groups in either year [[Table 1]]. There was a two-way (area by noise sensitivity) interaction (F(2, 353) = 4.06, P = 0.018), suggesting that noise sensitivity had a differential effect on WHOQOL score depending on the area of residence [[Figure 2]]. This shows that noise sensitivity was not associated with WHOQOL score in people living in the non-airport area, whereas for those living near the airport, greater noise sensitivity was associated with lower WHOQOL scores. There was no three-way (area by year by noise sensitivity) interaction (F(2, 342) = 1.16, P = 0.314), suggesting that the effect did not change over time [[Figure 3]]. The four WHOQOL domains (physical, psychological, social, and environmental) were analyzed separately and using the same approach as for the overall WHOQOL score. In no case was there a three-way (area by year by noise sensitivity) interaction (all P > 0.25), implying that the pattern of the effects of noise sensitivity by area remained the same across the years. There was a two-way (area by noise sensitivity) interaction for physical (F(2, 338) = 3.30, P = 0.038) and social (F(2, 341) = 3.67, P = 0.027) domains, marginally for psychological (F(2, 338) = 2.35, P = 0.097) domain, and no interaction for environmental (F(2, 338) = 1.62, P = 0.199) domain. All of the two-way interactions are displayed in [Figure 4]. Several findings reported in this study indicate that noise sensitivity influences the relationship between aviation noise and health. These effects can be explained by three competing hypotheses. Hypothesis 1 is that noise sensitivity is a genuine risk factor and as such mediates the relationship between noise and health. Hypothesis 2 is that noise-sensitive individuals simply have a propensity to report poor health without necessarily experiencing it, and thus personality factors (i.e., negative affect) account for the link between noise and health., The third hypothesis is that noise sensitivity may reflect a vulnerability to illness in general, such that sensitivity to noise is merely a symptom of multiple other conditions and, therefore, would be expected to act as a moderator of the noise and health relationship as we have described previously. These hypotheses will now be explored in the light of the main findings. The main finding was an interaction between the area of dwelling (airport or non-airport) and noise sensitivity grouping [[Figure 2]]. This shows that people who are noise sensitive but do not live near noise sources have similar health to people who are not noise sensitive. However, among those dwelling near the airport, greater noise sensitivity was associated with poorer health. This finding is best explained by conceptualizing noise sensitivity as a moderator (Hypothesis 1), a notion that has been supported by previous research performed near a New Zealand airport. If noise sensitivity simply reflected a tendency to complain due to personality factors such as negative affect (Hypothesis 2), then equivalent mean WHOQOL scores would be expected for the noise-sensitive groups in both the airport and non-airport areas. This would also be the case if the self-report health ratings were driven by vulnerability to health problems (Hypothesis 3). Similarly, earlier findings suggested that noise-sensitive people had poorer self-reported health if they lived near a motorway, but not in quieter locations, and the results of this study suggest that the same applies to aviation noise. A key finding is that, for the non-airport sample, there are no differences in mean WHOQOL scores across the three noise sensitivity categories. This finding is also mirrored when decomposing the WHOQOL into its four constituent domains [[Figure 4]]. This finding speaks against the hypothesis that noise sensitivity is simply a marker for other disorders, disabilities, or disease processes, because higher noise sensitivity would be expected to be linked with lower self-reported health. This finding is also inconsistent with the negative affect hypothesis of noise sensitivity, which would predict that self-reported health would decrease as noise sensitivity increased, even in areas with little noise. However, these results can be explained if noise sensitivity is considered a moderator of noise-exposure-related health effects. Pertinently, in the absence of major noise sources, health integrity is equivalent across noise sensitivity categories. The consistency of the data across time is reasonable, with the results showing no detectable difference in the effect across two periods of observation separated by 3 years. Our findings showing significant differences in HRQOL between those residing in the proximity of a major airport versus those in a matched area support previous research undertaken in Australia. Accounting for important confounding variables and using the short-form health survey (SF-36) as a measure of self-reported health, Black and Black reported that mean physical functioning, general health, vitality, and mental health scores in a group exposed to aviation noise were significantly lower than a matched control group. Such a finding would be expected if aviation noise interfered with human biological processes such as sleep or cardiac function, and such impacts are now generally accepted., Our data support the findings of Black and Black and reinforce the case that noise exposure impacts HRQOL consistently over time. The findings also suggest that noise sensitivity could be the prevailing risk factor for noise-related health effects, and we would argue that any measure of the impact of noise on people should be taken alongside a measure of noise sensitivity because it is the interaction between the exposure (detectable sound) and the trait (noise sensitivity) that gives rise to the health effect seen here. Because the effects observed are interactions, and, therefore, have complexity, apparently simple measures will be misleading. For example, a slight health effect of noise measured over a sample would actually represent a combination of large effects in noise-sensitive people and the lack of effects in non-noise-sensitive people. We took great care over our socioeconomic status (SES) matching: noise sensitivity may potentially occur with a number of psychological conditions. [e.g., ,, Individuals with mental illnesses often dwell in low SES or high deprivation neighborhoods, this being the central tenet of the so-called “drift” hypothesis. By demographically matching our airport and non-airport areas, we selected areas that could meaningfully be compared. Our data suggest that noise-sensitive individuals may be putting their health at risk by living in areas containing noise. As in our previous research, the proportion of noise-sensitive and non-noise-sensitive people in each of the areas was very similar. This appears surprising; why would a person who reports himself or herself to be highly sensitive to noise live in a noisy area? We suspect that the cultural norms around noise sensitivity may govern this; because noise is regarded as acceptable and unavoidable by New Zealand society at large, those who are noise sensitive may feel that the annoyance and health effects that they experience are not sufficiently important to raise when making a decision about the choice of dwelling, particularly given the numerous other factors that also need to be considered when making such a decision. Qualitative research investigating this is called for, as are biomedical studies designed to reveal the neuropsychological underpinnings of noise sensitivity. One limitation of this research, and a possible reason for some of the weaker effects, is that the people in the non-airport area sometimes complain of noise too. The effects may have been clearer had the control area been truly quiet; however, the use of a real-world control with matched socioeconomic status allowed a fair comparison that showed the impact of noise from airplanes over and above the other forms of noise. Another limitation was the difference in the educational and health status of the two groups. Despite careful matching on the basis of the socioeconomic status of each area, the respondents differed somewhat on these demographic indicators. Nonetheless, statistical control could be applied, and findings were, therefore, not contaminated by these sampling differences. In summary, noise-sensitive people who are exposed to noise from aircraft have poorer self-reported health than non-noise-sensitive people with the same exposure, and noise-sensitive people who are not so exposed. We have replicated our previous findings relating to noise exposure from motorways in a different (airport) setting, and have also demonstrated that the effect was present in the same geographical areas when measured at time points separated by 3 years. Berglund B, Hassmen P, Job PR. Sources and effects of low-frequency noise. J Acoust Soc Am 1996;99:2985-3002. Fidel S, Tabachnick B, Mestre V, Fidel L. Aircraft noise-induced awakenings are more reasonably predicted from relative than from absolute sound exposure levels. J Acoust Soc Am 2013;134:3645-53. Lambert J, Champelovier P, Vernet I. Assessing the railway bonus: The need to examine the “new infrastructure” effect. Proceedings of the Inter-Noise 98—The International Congress on Noise Control Engineering: Sound and Silence: Setting the Balance, Christchurch, New Zealand, 1998, p. 4-8. Berglund B, Lindvall T, Schwela DH. World Health Organisation Guidelines for Community Noise. Geneva, Switzerland: WHO; 1999. Shepherd D, McBride D, Welch D, Dirks KN, Hill EM. Evaluating the impact of wind turbine noise on health-related quality of life. Noise Health 2011;13:333-9. Welch D, Shepherd D, Dirks KN, McBride D, Marsh S. Road traffic noise and health-related quality of life: A cross-sectional study. Noise Health 2013;15:224-30. World Health Organisation. WHOQOL-BREF. Geneva: WHO; 1996. Paunovic K, Jakovljevic B, Belojevic G. Predictors of noise annoyance in noisy and quiet urban streets. Sci Total Environ 2009;407:3707-11. Stansfeld SA. Noise, noise sensitivity and psychiatric disorder: Epidemiological and psychophysiological studies. Psychol Med 1992;Suppl 22:1-44. Fyhri A, Klaeboe R. Road traffic noise, sensitivity, annoyance and self-reported health—A structural equation model exercise. Environ Int 2009;35:91-7. Salmond C, Crampton P, Atkinson J. NZDEP 2006 Index of Deprivation. Wellington: Department of Public Health, University of Otago; 2007. Intervistas Consulting Inc. Wellington International Airport Air Traffic Forecasts; 2015. Shepherd D, Heinonen-Guzejevb M, Hautus MJ, Heikkiläb K. Elucidating the relationship between noise sensitivity and personality. Noise Health 2015;17:54-9. Shepherd D, Heinonen-Guzejevb M, Heikkiläb K, Dirks K, Hautus MJ, Welch D et al. The negative affect hypothesis of noise sensitivity. Int J Environ Res Public Health 2015;12:5284-303. Black DA, Black JA. Aircraft noise exposure and resident’s stress and hypertension: A public health perspective for airport environmental management. J Air Transp Manag 2007;13:264-76. Landon J, Shepherd D, Lodhia V. A qualitative study of noise sensitivity in adults with autism spectrum disorder. Res Autism Spectr Disord 2016;32:43–52. Landon J, Shepherd D, McGarry M, Miller R. When it’s quiet, it’s nice: Noise sensitivity in schizophrenia. Psychiatr Rehabil 2016;19:122-35. Landon J, Shepherd D, Stuart S, Theadom A, Freundlich S. Hearing every footstep: Noise sensitivity in individuals following traumatic brain injury. Neuropsychol Rehabil 2012;22:391-407. Fox JW. Social class, mental illness, and social mobility: The social selection-drift hypothesis for serious mental illness. J Health Soc Behav 1990;31:344-53. Kliuchko M, Heinonen-Guzejev M, Vuust P, Tervaniemi M, Brattico E. A window into the brain mechanisms associated with noise sensitivity. Sci Rep 2016;6:39236.